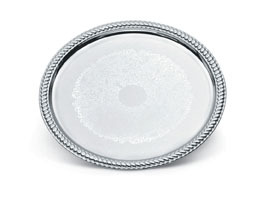 These value priced trays complement casual or formal banquet applications and are ideal for catered events. Various styles to meet your serving needs. Tough chrome plating provides long life|Mirror-finish|Surface safe for direct food contact|Premium product at an economy price|*Not dishwasher safe. Recommend cleaning with sponge, mild detergent, and warm water.